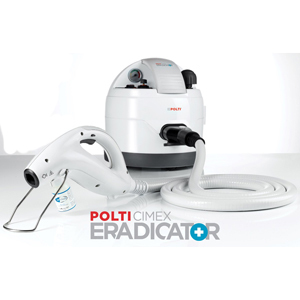 The Polti Cimex Eradicator is a bed bug steamer designed for pest management professionals. The boiler and patented nozzle generate a powerful flow of superheated dry steam that reaches up to 356°F, killing adult bed bugs and eggs in seconds. This flexible bed bug “killing machine” is chemical-free and able to be used on any surface.